August’s weather was perfect for golf, with the South Kyme course looking and playing very well. The ladies’ EWGA monthly medal was a closely fought match and was won by Paula Young with 75 net, on countback from Anne Clayton. Sue Roberts came in third with 76. Heather Dopierala won the Sunday Medal with 76 net on countback from Sue Annibal and Sue Roberts. Paula Young won the aggregate Order of Merit points for the month. The monthly Stableford competition was won by lady captain Sue Duncan with 36 points. Runners-up was Carole Gaunt with 34 on countback from Heather Dopierala. The Medal Winners Trophy was won this year by Anne Clayton with 78 net. Shirley Westlake came second and Joan Cowie third. Sue Roberts won the Cancer Spoon competition with 38 points on a countback from Sue Annibal, and in third place was Paula Young with 35. It was a sunny and warm weekend for the Club Championships which were played over two days. Sue Roberts won the Ladies’ Gross Trophy, and Sue Duncan was the winner of the Handicap Trophy. Paul Russell was the eventual winner of the Gents Trophy after a nail biting six hole play-off with last year’s winner Ryan Trow. A barbecue was enjoyed by all before the presentation. South Kyme ladies went to Kirton Holme for their return league match, resulting in a half, and the friendly match the following week at Kirton Holme was also halved. The popular Mixed Section monthly roll-up was won by Liz and Alan Jude. 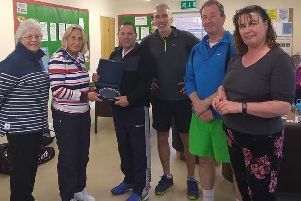 Runners-up were Sue Duncan and husband Ray, whilst in third place were Nicky and Martin Scott. It was a full field for the shotgun start Captain’s Day competition, with Sue Annibal winning the Lady Captain’s Trophy. Mark Walker triumphed in the Gents’ Championship Cup and the Silver Jubilee Cup.